Managing a big company takes a lot of knowledge and skill, and corporate management requires proficiency in leadership, administration, and directing. This free online business course will guide you through the most important tasks performed by corporate managers, including strategic planning, managing company resources, and ensuring the achievement of company objectives. This knowledge will take your management career to the next level. 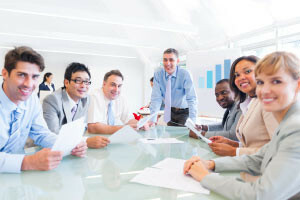 This Business Skills training course will introduce you to the world of corporate management. You will first study how to manage large scale organizations and the environment in which they operate. Next, you will learn how to evaluate organizational performance using key performance indicators (KPIs), which will help you to monitor the productivity of your staff and employees. The course will then discuss company management structures and objectives, the different management roles within an organization, and policy development. You will then study the different management styles that you can apply to your organization. The course will cover the different management skills and competencies required to be an effective manager, including some useful approaches to managing change in a large, dynamic organization. You will also get an overview of the triggers, effects, and resistance that you may encounter in the implementation of such change, which will help you manage a smooth transition. Gaining a clearer understanding of how large businesses and organizations operate will ensure that you are well-prepared for the challenges your company is going to face. This course will help you as a business professional to improve your corporate management skills by clearly explaining how large business systems operations. This will also open up opportunities for career advancement and promotion. So why wait? Try out this free online management course today and learn valuable business management skills in no time. Describe the characteristics of large-scale organisations. Describe the functions of different types of organisation and the environment in which they operate. Evaluate organisational performance using key performance indicators (KPIs). Discuss the role of management within an organisation. Explain the differences in management styles. Identify the key skills required to be an effective manager. The course highlights information that will assist in good corporate management.